The dire wolf became extinct somewhere between 4,000 and 16,000 years ago. 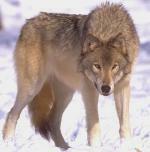 This is thought to be partially because of its inability to compete with the faster, more intelligent gray wolf. It is the largest canid known to ever exist. And though it was similar in many ways to the gray wolf, the dire wolf was heavier built, more robust, with shorter and more powerful legs, and a larger head. Being a heavier animal with shorter legs, the dire wolf would have been slower and less adept at catching prey than the gray wolf. It is, therefore, believed that the dire wolf was more of a scavenger than predator. It would, however, hunt when the opportunity was there. Its teeth were more massive and strong, allowing it to easily consume carcasses. Although its head was larger, the brain case was smaller (A scavenger does not need to outsmart its prey). Also, being larger in size, it would have had less competition. A fossilized bone was discovered near the Ohio River in Indiana in 1854. 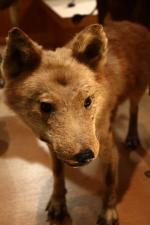 However, it wasn't until years later it was determined that this fossil was of an unknown wolf species. It was named Canis Dirus, the Dire Wolf. Thousands of canis dirus fossils have been recovered from the La Brea tar pits in Los Angeles, California where water would be left floating on top of the tar after it rained. When attempting to drink from the pools of water, animals often became trapped in the tar below. The dire wolf and other predators, attempting to feed on the trapped animals, would often become trapped in the tar themselves. 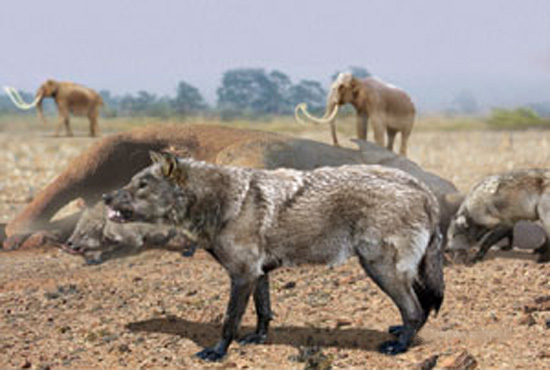 Dire Wolf fossils have been found in North, Central, and South America. Their exact range, however, is unknown.